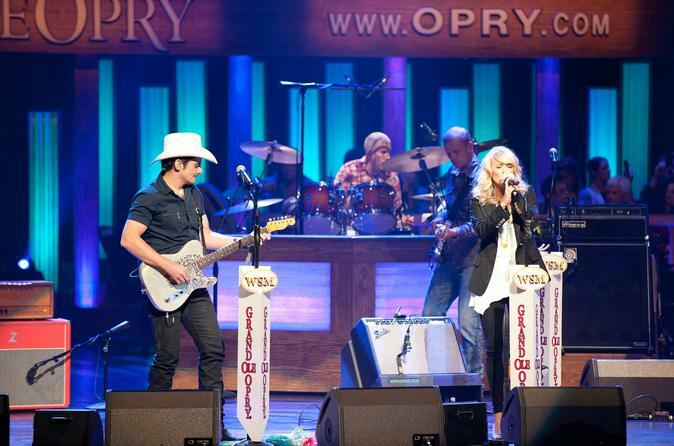 Make your way to the Grand Ole Opry with your ticket for a great seat and a classic country music experience. Started in 1925 as a local radio broadcast, the Opry quickly become popular for its musical variety show, which features styles from bluegrass to modern country. The venue has continued to be a hotbed for introducing new talent, both bands and solo musicians, and has boosted the careers of hundreds of famous country musicians. It is also the home base for the United States' longest-running live radio show. Note the large wooden circle on stage; the six-foot (2-m) oak piece was cut from the stage of the Ryman Auditorium, the original home of the Opry until it moved to the current building in 1974. Outside of the Opry, snap some fun photos of the giant guitar statues and Opry signage. Once you're in, enjoy the 2-hour show. Each performance features six to eight bands or artists from a wide spectrum of musicians. Some of the superstars that have performed here include Patsy Cline, Vince Gill, Alison Krauss, Willie Nelson, Carrie Underwood and Jimmy Dickens. Afterward, head home or to your hotel knowing that you just experienced a show at one of the world’s most famous country music venues. PLEASE NOTE: The Grand Ole Opry Show location will vary based on Travel Date. Shows will perform at the Ryman Auditorium between November 4th - January 31st.